A first edition of Harry Potter and the Philosopher's Stone, the first of J.K. Rowling's hugely successful novels about a boy wizard, is to be sold at Bonhams Fine Books and Manuscripts Sale in London on 9 November. The copy, described as being in exceptionally fine condition, is estimated at £15,000-20,000. 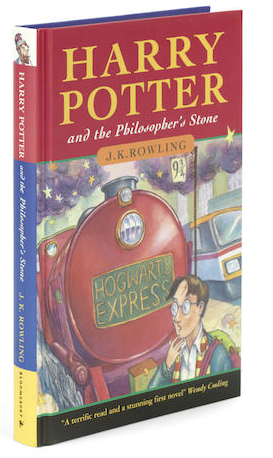 Harry Potter and the Philosopher's Stone was published in 1997 by Bloomsbury and became an instant bestseller. It scooped most children's literature awards in the UK and, after its publication in the USA under the title, Harry Potter and the Sorcerer's Stone in 1988, stayed near the top of the New York Times Best Sellers list for most of 1999 and 2000. Like the succeeding novels in the seven book series,it was turned into a feature film making stars of its three young main actors and engaging a host of major British actors. Among Harry Potter fans and book collectors alike, the first edition of Harry Potter and the Philosopher's Stone is also known for the repetition on page 53 of '1 wand' in the list of equipment that pupils must take with them to Hogwarts at the beginning of term. This error was corrected in subsequent editions. Bonhams Head of Books and Manuscripts, Matthew Haley, said, "As the first book in the series, Harry Potter and the Philosopher's Stone has a special place in the affections of the millions of readers across the world and the proof reading error about the wand in the first edition has, of course, become a treasured piece of Harry Potter arcana. Like most enduring books aimed at younger readers, the Harry Potter books also have wide appeal to adults and there is a strong market among collectors for first editions. This copy is in excellent condition - one of the very best I've seen - and we're expecting a lot of interest."